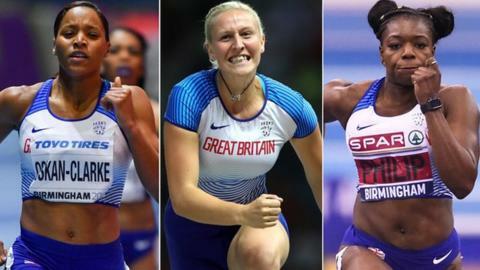 Former 1500m world champion Steve Cram has picked his British athletes to watch at the European Indoor Championships, which began on Friday in Glasgow. Cram, part of BBC's commentary team, expects GB to shine on home soil over the three days of competition. "I'll be surprised if there are many stronger teams. We're not competing against Russia, who still remain banned from athletics competitions. Oskan-Clarke took silver two years ago in Belgrade. Mari Smith and Adelle Tracey make up the British trio. "Shelayna has a great chance to go one better from 2017 and win gold. She controls races indoors and rarely gets it wrong tactically. "It's a pretty open event, but on home soil she's probably the favourite. Switzerland's Selina Buchel, the reigning champion, will provide stiff competition and has been in good form recently. "I suspect when Shelayna lines up in the final there will be names familiar to her. However, she'll have the opportunity to control the race and the rest will have to try to wrench it from her." Philip and Kilty are the defending champions. Kilty, who had Achilles surgery last summer, was originally excluded from the squad having failed to record the qualifying mark of sub-6.60 seconds. However, he will now race following an invitation from the European Athletics Council. "The women's event will be interesting, but the men's will be pretty poor. "Regarding reigning champion Richard Kilty, there was some controversy over his selection because of the initial decision to leave him out. I wasn't surprised by that, nor by the subsequent invitation. "I thought he ran reasonably well at the Birmingham Grand Prix where he finished fifth. Let's hope Richard takes advantage of the invite. Some of our guys managed the qualifying time [CJ Ujah and Reece Prescod] but this event wasn't in their plans. "Kilty has to find that little bit extra, but I think he will - he's had a couple of weeks to train since Birmingham. The standard is average in the men's event - so he might not have to do what he has done in previous years. "The women's sprint event is better. Asha is up against Poland's Ewa Swoboda, who took bronze in 2017 and will provide a stiff test but the Briton looks in great nick and looks well-conditioned. I'll be stunned if she doesn't win another medal." The World and European Indoors champion was unable to compete at the British Athletics Indoor Championships earlier this month and had his place confirmed for Glasgow earlier this week after proving his fitness. "Andrew won the world title last year but has lot to live up to. He will be there or thereabouts, although he won't be running as quick as he did last year. "As for his rivals, the Cypriot Milan Trajkovic ran well at the Birmingham Grand Prix, by finishing third. Andrew knows what he's up against and is pretty familiar with the guys. "What I will say about him is if he didn't think he could win a medal here then he wouldn't come." The 27-year-old beat some of the world's best at the recent Birmingham Grand Prix. "Holly's not been in this sort of form since 2012. She's attempting the heights she was back then. "Russian athlete Anzhelika Sidorova, who won European outdoor gold in 2014 and is competing as a neutral, is vaulting well. "Holly has said in big championships she has to convert good performances into major performances. On European level she has to win a medal, but if she wins this it'll be a massive, massive boost for her for the rest of the year." The Scot is hoping to defend her double crowns. "Britain haven't got too many at the top of the world in their event. "I really wouldn't want to put anybody up against Laura indoors - she's a brilliant indoors runner. She knows the track in Glasgow incredibly well and does a lot of laps around there in the winter. "She's set herself a difficult target by doing the double because Friday evening (the first day of the competition) is going to be busy - running a 1500m heat followed by the 3,000m final about one-and-a half-hour later. "Her only genuine rival is German Konstanze Klosterhalfen. She's also entered both events, but we're not clear if she'll actually line up for both. "Compared to 2017, both events contain stronger rivals. If Laura gets a tough 1500m heat it would make the task of winning the 3,000m harder. "Melissa Courtney and Eilish McColgan will also take part in the 3,000m. Melissa is in fantastic form (having run the second fastest 3,000m this year) and will have eye on a medal." The 26-year-old enjoyed her most successful season in 2018 when she won world pentathlon gold before taking the Commonwealth heptathlon title. "We're all disappointed reigning, world and Olympic champion and Nafi Thiam won't be there but that enhances KJT's chances dramatically. "This will be a big two years for her with the World Championships in Doha and then the 2020 Tokyo Olympics. At this event she will want to continue the winning habit. The multi-sport events are not about one big performance but about being good throughout the competition - she's getting better at putting a competition together. "For British youngster Niamh Emerson, who received an invitation from European Athletics, this is a massive opportunity. "She won bronze at the Commonwealths, which were a massive learning curve. I'll be gobsmacked if she doesn't produce a personal best."